Say hello to Alejandro Betancourt, the sous chef over at Latin Bites. 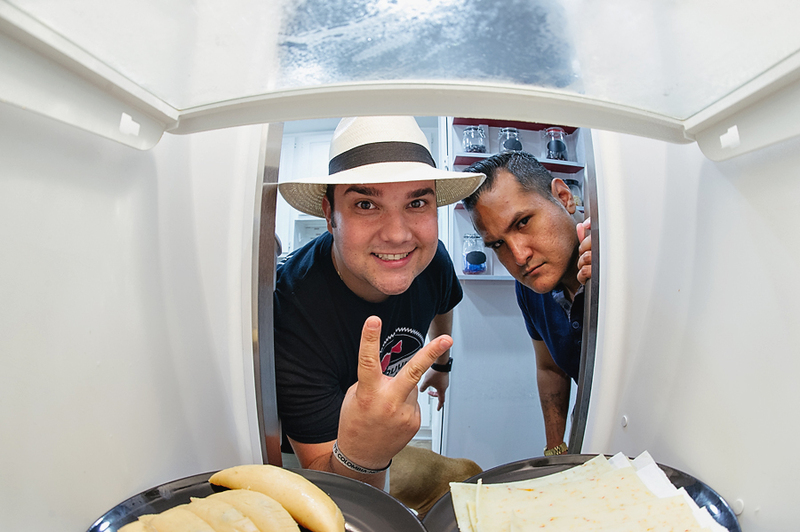 For our shoot Alejandro made empenadas and a colombian burger. The empenadas are a secret recipe from his dad and were accompanied by some aji spicy sauce. The Colombian burger was made with pepper jack cheese, caramelized onions, tomato, sliced avocado, grilled pineapple, lemon potato chips, living butter lettuce, and the bun was dressed with blackberry preserve, ketchup, mustard, mayo, and topped off with some honey. Cooking on his time away from the restaurant usually involves family. On this occasion Alejandro invited me to his brothers house where his friend chef Roberto Castre, the executive chef at Latin Bites, also joined us for the shoot. Even though there has been burgers here on the blog in the past, I'm sure I'll get questions about which one was better. The simple answer is they're both fantastic in their own right.